Interest rate risk – risk that the value of the bond may be adversely affected by the prevailing direction of interest rates. The single most important factor influencing the price of bonds is the prevailing market interest rate (e.g. if Bank Negara reduces interest rates, bonds become more attractive and its prices will rise) Therefore, the study of interest rate movements is important for bond trading. Liquidity risk – risk that a bondholder may be unable to sell a bond due to thin trading conditions. Inflation risk -risk that the value of a bondholder’s investment will be eroded by the effects of inflation. Fixed rate coupons and principal amounts will end up being worth less in real terms if inflation is high during the bond’s lifetime. The normal relationship is that an investor who takes higher risk demands a higher return. From this we can see that risk-free bonds such as those issued or guaranteed by the Government offer the lowest yields, while more risky bonds issued by corporations will offer higher yields. For corporate bonds, the rating scale from rating agencies measures the riskiness of the bond. The relationship between the risk and return appetite for the whole market for a specified time period can be graphically seen in a yield curve. The yield curve is the starting point for every investor. 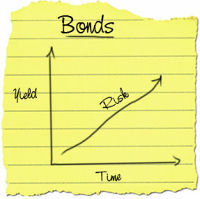 One must study the yield curve first before deciding if a bond offers an attractive yield given its risk and tenor. Previous post: Green Home is the Wisest Investment for a Sustainable Future Next post: The Third Way of Shopping!